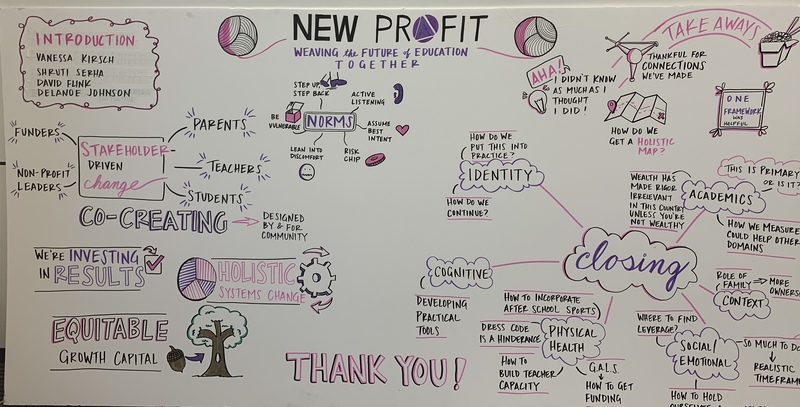 For the last six years, New Profit’s Reimagine Learning Fund has brought together leaders in the K-12 education space at our annual convening to tackle some of the most pressing issues facing education in our nation. This year, recognizing the need for an integrated approach to education, we brought together all of the different threads of New Profit’s education work—Reimagine Learning, parent empowerment, youth activation, personalized learning, and regional impact—for a two-day convening, “Weaving the Future of Education Together.” Over the course of two days, we welcomed 170 youth, parents, educators, school district leaders, funders, nonprofit leaders, and other education practitioners to Boston to think about how to implement an integrated approach to whole child development in their work and to bridge silos, build connections and a sense of community, and develop concrete action steps both individually and collectively. 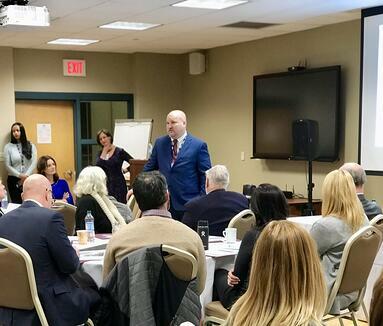 Day 1 of our convening consisted of a set of events for specific sub-groups within our network, including a Youth Activation Day co-hosted by PeerForward, a Practitioners’ Working Group, and the Essex County Learning Community Showcase of Learning. On December 4th, 32 leaders of youth activation organizations along with youth activators, superintendents, and educators representing the school districts of Stockton, Dallas, New York City, Prince George’s County, and Los Angeles gathered in Boston to explore how students can fully partner with educators to tackle community challenges and make learning more relevant. The gathering, co-facilitated by PeerForward and New Profit, featured youth leaders Nastassja Morton and Sergio Flores framing the meaning of Youth Activation; student/educator teams developing plans to equip more youth to create solutions to challenges that matter to them; and keynote speaker Jaime Harrison—the first African American Floor Director of the U.S. House, author of Climbing the Hill, and currently Associate Director of the DNC—sharing how he has used the youth activation skills he developed in high school at every crucial stage of his career and to affect change in the political arena. Palpable enthusiasm flowed in the room throughout the day. Young people are energetically and effectively tackling important challenges in their communities. The limitation is not the youth’s vision and ability, but systems that restrict student agency and legacy expectations that limit adult imagination. Youth Activation provides a powerful identity framework for young people. In other words, when students define themselves as youth activators, they equip themselves with mindsets and skills to own their learning and the success of their peers and broader community. Measurement progress is needed to improve the practice of Youth Activation. Participants called for developing a common language and framework for how to measure and manage performance across a continuum of Youth Activation strategies. At the end of the gathering, one youth activator summarized the spirit of the day and the progress made, writing: “I feel inspired, excited and prepared to do as much as possible to get my peers to look forward to the future with optimism.” Please click here for the full Youth Activation Meeting report. Through the leaders’ self-assessments of where their organizations excelled as a “learning organization," we saw that regardless of your individual role and your organization’s age and stage, all nonprofits need to pay attention to what it takes to learn and grow. One of the critical elements of continuous learning in an organization is psychological safety. As Amy Edmundson defines it, psychological safety is a belief that one will not be punished or humiliated for speaking up with ideas, questions, concerns, or mistakes. In our work in education and social change, we know that in order for there to be psychological safety in our organizations, we must also ensure our organizations are focused on diversity, equity, and inclusion in their programs, on their teams, and with their boards. We saw the strength of a unique combination of smaller organizations focused on serving students with learning differences and large general education organizations engaging in rapid consultancy and advice sessions, where each organization had the opportunity to learn from others in the room by hearing about how others tackled similar challenges, gaining a connection to other resources and partnerships, and more. The Essex County Learning Community (ECLC) is a cohort of six small suburban school districts in Massachusetts that are in close proximity to one another. With generous support from the Peter and Elizabeth C. Tower Foundation, New Profit formed the ECLC to create a space for educators to learn, to reflect, and to connect across geographic boundaries—something they rarely, if ever, do. Their charge was to learn how to better serve students with learning differences, including children with learning disabilities, learning and attention issues, behavioral challenges, those suffering from the effects of trauma, those living in poverty, and the increasing racial, cultural, and language diversity that educators need to better understand in order to maximize students’ learning. For teachers and administrators in small districts, this is particularly difficult work because they typically have fewer resources than large districts. But the issues are similar—especially with the rapidly shifting demographics of the suburbs. To date, these educators haven’t had the same access to philanthropy or to the expertise that flows to larger districts. The ECLC aims to change that equation by bringing educators together to learn from national experts and share best practices. The ECLC started meeting regularly last May. On December 4th, the six districts presented their Action Plans for district and school improvement at a “Showcase of Learning” at which they received feedback from one another and from special guests from each district and community, including school committee members, superintendents, community leaders, and area philanthropists. These presentations marked the culmination of eight months of internal and cross-district meetings as well as monthly meetings of each of three cross-district teacher teams focused on academics, social emotional learning, and cultural competency and proficiency. Massachusetts Commissioner of Elementary and Secondary Education, Jeffrey C. Riley, delivered opening remarks at the event. He told the attendees that, while Massachusetts often boasts that it “leads the nation” in education, sub-group data offer a much less flattering portrait, one in which far too many students do not have access to opportunity and therefore lag in achievement. He also urged people to stop viewing test scores as silver bullets, and to start embracing a much broader mindset about learning and assessment. Finally, Riley, who has made high-quality teacher professional development one of his top priorities, talked about the importance of appreciating teachers for the complex work they do every day in our schools. The Showcase of Learning also featured a panel of district and school leaders and teachers, who reflected on their experiences in the ECLC. A celebratory dinner, a sparkling cider toast, and a cake cutting ceremony followed. On Day 2 of our convening we brought together the groups from Day 1 in addition to others in our network for a full day of learning, discussion, and collaboration. Day 2 was an explorative journey through the Chan Zuckerberg Initiative’s Comprehensive Student Development framework, giving attendees an opportunity to dissect, debate, experience, and reflect on learnings throughout the day. At the outset, the group was asked to put a stake in the ground on which of the domains took primacy in their work. Though we understand that in order to truly embody the whole child each of these domains is essential in its own right, we encouraged attendees to reflect deeply on their day to day work and how it fits into the framework. Each of the six domains of this framework was represented by a piece of colored yarn corresponding with the color of the domain. Participants were asked to tie the yarn color(s) that match the focus of their work to their lanyards, which sparked interesting discussions right out of the gate. Some participants chose to tie every colored piece of yarn to their lanyard, as a reflection that all of the domains took primacy in their work. One of the young people in the room, Moises Urena, surfaced the fact that the center of the framework—Community, Relationships, and Environment—was not represented by the six colors of yarn, and suggested that we add that as an option. Moises’ move to add this to the mix was emblematic of the rich energy that was in the room. Individuals were primed, ready to learn, challenge each other, and take risks. Next up was our panel discussion, “What Matters Most? A Critical Debate on What Part of Whole Child Development Is Most Important,” during which each panelist made a strong argument for why a single domain of the CSD framework should have the most focus. The panelists, comprised of three practitioners, one parent, and one student, chose to highlight Identity Development, Academic Development, Social & Emotional Learning, Physical Health, and Community based on their experience. Through this panel, it became clear that no matter which of the domains participants chose as the one taking primacy in their work, there was an undeniable interconnectedness. This idea was brought to life when Michelle Odemwingie of Achievement Network made the argument that academics were the most important in the lives of students and their future, which was met with a counter argument by Dawn Foye of Citizen Schools stating that without having the right social and emotional support for her son, he would not be able to be present in a classroom to learn and focus on academics. This panel highlighted the idea that in order to truly meet the needs of all students, integration and collaboration across domains is necessary, but that could not be done without intentionality and thoughtfulness in your approach. After a hour-long lunch break full of networking and connections, participants then experienced our Live Learning Environments. Four innovative organizations from around the country joined us to set up mock learning environments that put each of our participants in the shoes of a student at their schools. Each school model illustrates the integration of multiple domains of the Comprehensive Student Development framework, and the Live Learning Environments were designed to be emblematic of this integration. Each participant experienced two of the following four Live Learning Environments. This Live Learning Environment focused on physical, mental, academic, identity and community/relationships in an activity that helps students conceptualize and actualize the convergence of all domain areas as a self-assessment with goals to support growth and aspirations. At NACA, students complete the self-assessment and setting/review of goals at least four times a year. Participants learned about the Native American Community Academy, NACA’s wellness philosophy, and the wellness wheel, a tool used at NACA to assist students in self-assessment within the four quadrant areas of wellness: Intellectual Wellness, Physical Wellness, Social/Emotional Wellness, and Community/Relationship Wellness. Participants had the opportunity to complete a wellness wheel and set goals based on their self-assessment. The session also focused on how NACA integrates students’ and staff identities into the curriculum and culture of the school. In this Live Learning Environment, GALS uniquely addressed each of the domains of CZI’s Comprehensive Student Development framework: cognitive, social-emotional, academic, physical health, mental health, and identity development. Participants were introduced to some of the routines and practices of a GALS Series class, and were invited to deepen their own emotional awareness by exploring their own Core Values. The session featured signature routines and practices of a GALS Series classroom, including Do Now, journaling, movement practices, group reflection, and exit tickets. The focus of City Year’s Live Learning Environment was social emotional development and positive developmental relationships. During this session, participants had an opportunity to gain familiarity with two effective social-emotional development assessment tools and then work together as “intervention teams” to test and build their skills in taking an asset-based approach to holistic development by (1) recasting challenges as assets and (2) thinking through intervention approaches that will be high impact for groups of students given shared needs and strengths. City Garden’s Live Learning Environment touched on all of the focus domain areas: cognitive, social-emotional, academic, physical health, mental health, identity development, community, relationships, and environment. The session invited participants into small group lessons given by a City Garden Montessori guide (teacher). City Garden’s early childhood curriculum is a unique and impactful combination of Montessori pedagogy with an anti-bias, anti-racism (ABAR) approach. Participants were invited back to childhood through guided Montessori lessons and exploration with a City Garden guide where they experienced first-hand a mode of early childhood education that is designed to support the whole child. There is a spectrum of positions about the role of academics. Some see it as having primacy—all the other elements of the whole child development model are a 'means' in service to this 'end'. Others see it as necessary but also a peer 'end' with the other elements of whole child development. While there remains debate about what to measure in academics, this domain has a lot to contribute to the other domains in their journeys to develop clear, rigorous measures—sharing both the good, bad and ugly from academics. We must ultimately hold all of our students to the same high academic standards. Access to opportunity is often achieved through academic success. Academic success should not be 'tracked' based on needs in the other domains of whole child development. We need to improve the way academics are presented and taught in our schools, including ensuring that literature and assessments represent the full diversity of the students we are teaching. Students need to be able to recognize themselves in the materials they are studying. The participants who selected this discussion group were all concerned with sub-populations of students with diverse learning needs. The “cognitive development” label seemed to be a kind of secret code that attracted participants who are concerned with the needs of diverse learners. Traditional assessments have shortcomings and they do not capture what's most important to measure. This applies to all learners, but the stakes are much higher for diverse learners, who often do not test well—the result being that they often do not experience success in school. How do we measure what really matters—beyond a single, crude number? Intentionality is the first step: we have to move from informally/inadvertently integrating some or all of the elements into our practices to intentionally designing our programs to incorporate and integrate all six domains of whole child development. We need to determine both what the non-negotiables are in terms of integrating these elements (e.g. “need to have” vs. “nice to have”) and what metrics we can use to track how well we are integrating them into our practices/programs while leaving flexibility to adapt to specific contexts and students. We need to determine how to make this feasible to achieve and not have it feel like "one more thing" that requires us to de-prioritize other important aspects of our work. Physical health is often not prioritized or encouraged by our work culture. For example, entrepreneurial work culture revolves around little sleep, junk food, and long hours without the possibility for exercise. Schools often sacrifice a focus on physical health in favor of academics. Schools need to be redesigned around the whole child—it is not enough just to have physical education and sports available to students; a focus on whole child development needs to be baked into each school's philosophy. We need to think about how to train teachers to commit to their own physical health and to learn how to foster this commitment among their students. While there was alignment on the importance of focusing on identity development, participants were unsure about what steps to take to "undo what we have been taught about ourselves on our identity." For example, participants wanted to know if there was a supported curriculum out there for this type of work. This group tackled the questions of how to shift the perception and lived experience from school being a place to go to school as an integral part and extension of the community. To do this, it’s critical to have young people and parents involved in discussions of how to reimagine education—they are not just beneficiaries but need to be owners. It is helpful to think about some examples of this in practice (e.g., one school where young people are accountable to their classmates for attending school). All of this is in service of ensuring we have strong leaders at all levels of education and our learning environments and communities are safe, caring, and loving. What are you taking away from this convening? What will you do differently in your work? What did you learn that you're taking home with you? Thank you to all of our attendees for your active and thoughtful participation in our 2018 Education Convening: Weaving the Future of Education Together!